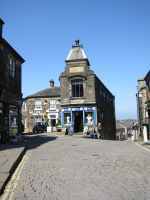 Taking in Main St Haworth, Oakworth station, Mytholmes tunnel, Ebor Mill, Haworth Station. The Tourist Information Centre was the Butchers shop in the film. Head on down Main St.
Continue down Main St, look out for Lodge St on your right, the house on the corner is where the children were given a small shovel for Mr Perks Birthday. 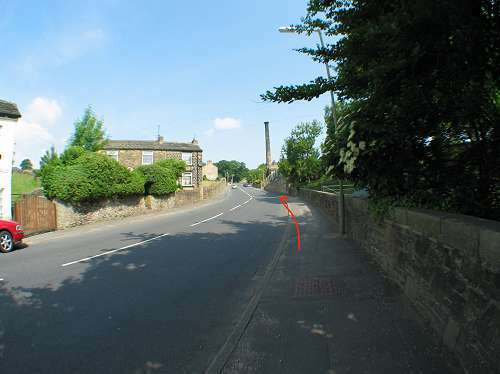 At the Fleece Inn on the right, take the road left which descends steeply. Just past the school and Community Centre there is an unmade road. Turn left and continue to end and take a right turn. 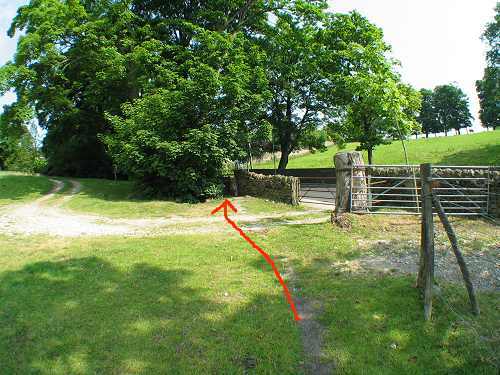 Follow the path to the left, down to a Kissing Gate, go through and you are on Greenfields, continue on the path. Continue down Mytholmes Lane, staying on the right hand side pavement. Cross over Ebor Lane. Continue downhill, at the bottom the road becomes Providence Lane. 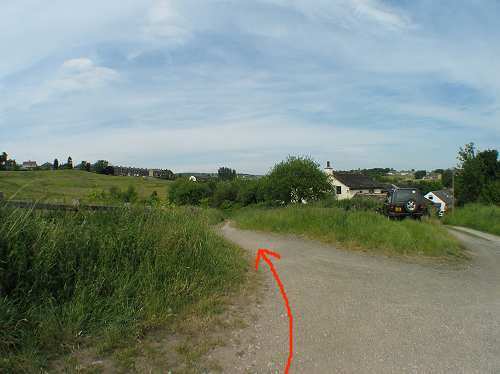 Continue uphill, opposite the row of cottages and before the mill chimney on your right is the footpath. Click on the picture for more detail. Climb the steps (locally known as the ABC steps as apparently there are 26 of them) and continue along the path, the railway can be seen on your right. Along the section they filmed parts of the paper chase and the landslide. You can glimpse Mytholmes tunnel. Continue along the path. 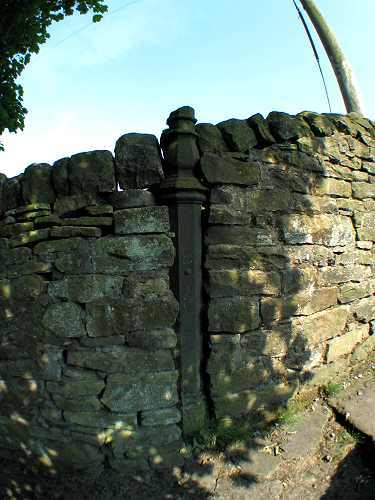 You can see the remains of the old street lamps still in the stone walls. Click on the picture left for more detail. Go through the iron kissing gate and continue along footpath. Click on the picture for more detail. Past the gate on the left is another kissing gate, go through and a turn right brings you on to Station Rd. Click on the picture for more detail. 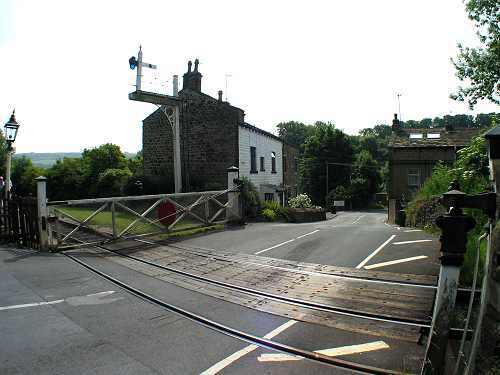 Over the railway crossing on the left is a white cottage which was Perks Cottage in the film. The house next door has been recently added. Click on thumbnail for bigger picture. 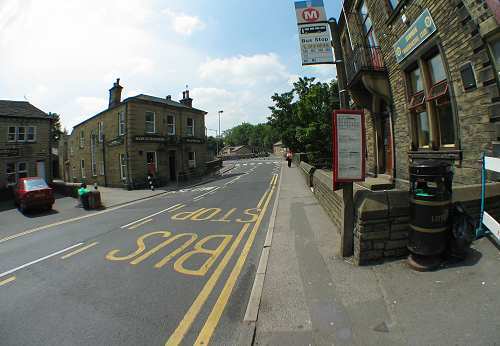 Continue downhill along Station road which bends round to the right. Continue along, under Vale Mill. Click on the picture for more detail. 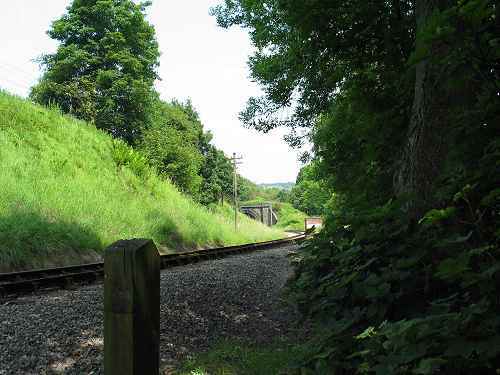 As you go under the tunnel there is a pillar on the right, it is one of the remaining stanchions that took the railway to the left before Mytholmes tunnel was built. 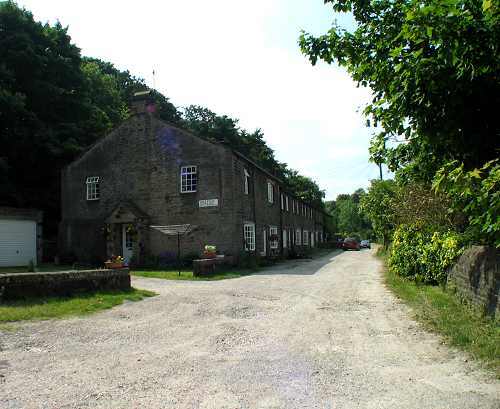 Continue along the road, take a right into the unmade road (start of Mytholmes Lane) which is Vale Fold Cottages which featured in the paper chase. Click on photo for bigger picture. 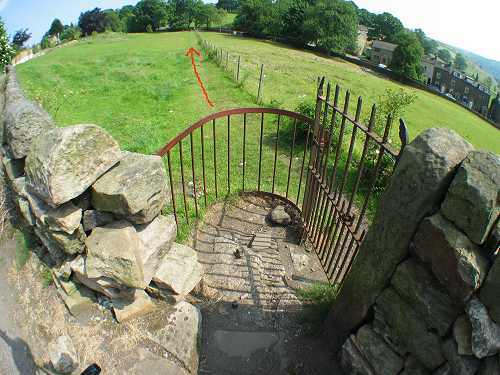 Go through the gate, on your right is Bridgehouse Beck and on your left is a strip of land where the railway used to go before they built Mytholmes tunnel. 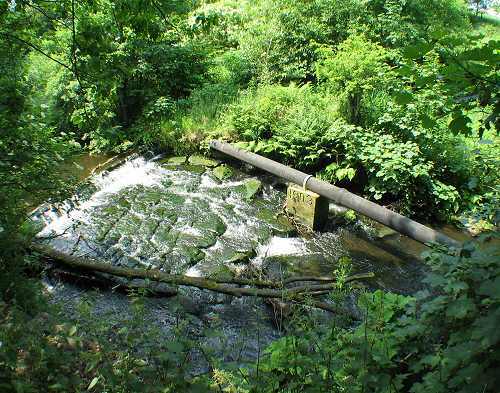 Walking beside the Beck look out for Kingfishers more... and Dippers more... flying along the river. At the end of the footpath the bridge on the right is where they filmed the end sequence of the film, Roberta holding a chalk board. 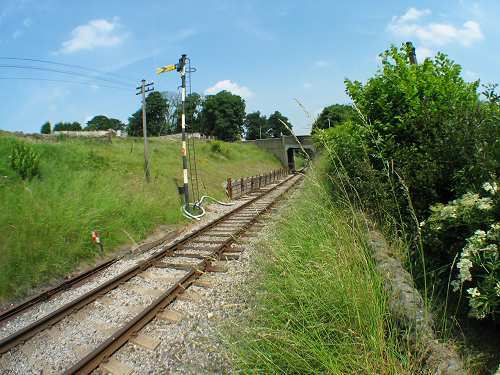 The old metal bridge was replaced in the 1990's. Cross over Ebor lane. Click on photo for more detail. 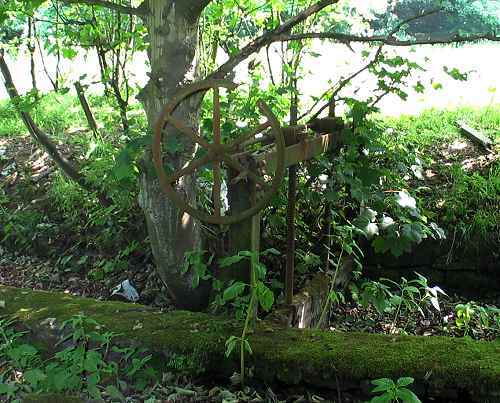 The earliest part of the mill are the buildings next to the road on your left which were built around 1819 by Hiram Craven, and were water powered. To the rear next to the tall chimney the spinning mill was constructed in 1850 by the Merrall family. In 1887 they built the large 5 storey Mill. 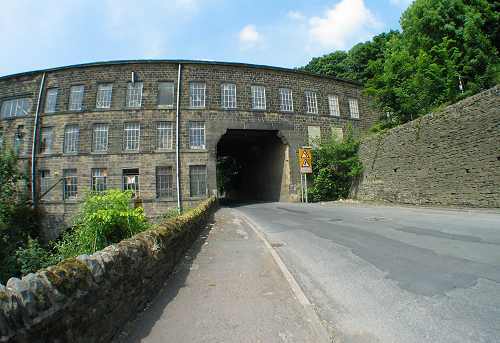 This Mill expansion is reflected in the growth of the railway network, the Keighley & Worth Valley railway was built in 1867 , many of the local mill owners such as Merrall's were directors of the railway. Carry on walking up Ebor Lane, as you get to the top look out for the Toll Sign set in the wall, it is the same description as the one earlier in the walk at 8) Ebor Lane. 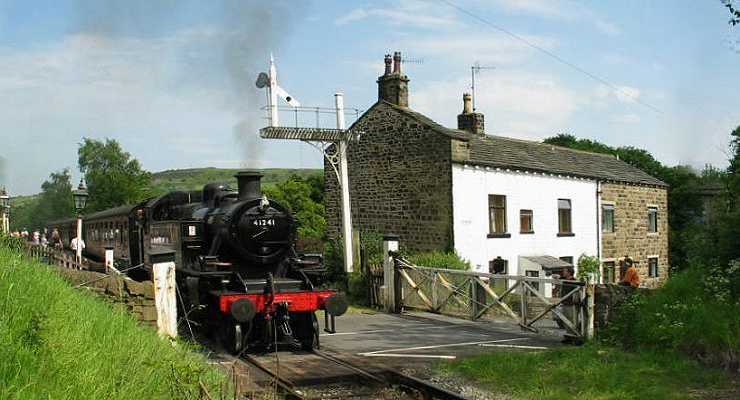 Continue walking along Mill Hey, you will see Haworth Railway Station on your right. Click on photo for more detail.